Our Winograsky columns have come a long way from our previous post two weeks ago. To review what a Winogradsky column is and our goals for them please see: Adventures with Winogradskies. Green layers have started to develop on the top of some of the tubes and to a less visible extent on some of the larger containers. In some tubes we are starting to see defined layers. 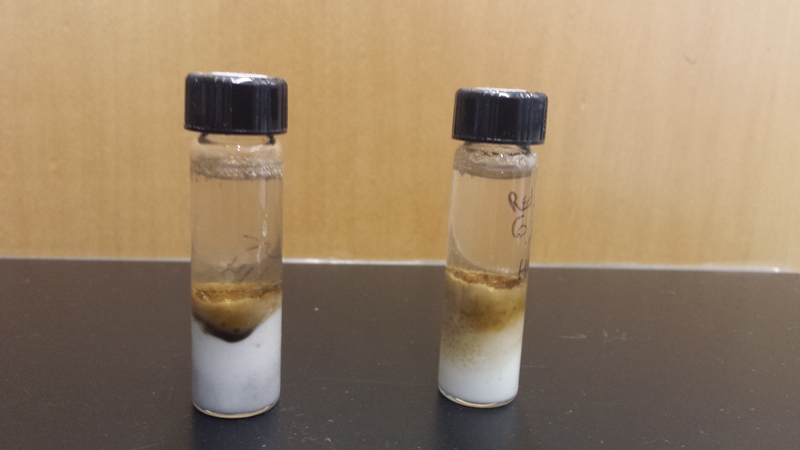 Layers seem to vary between tubes containing seawater from different sample locations as well as between tubes with water from the same location. 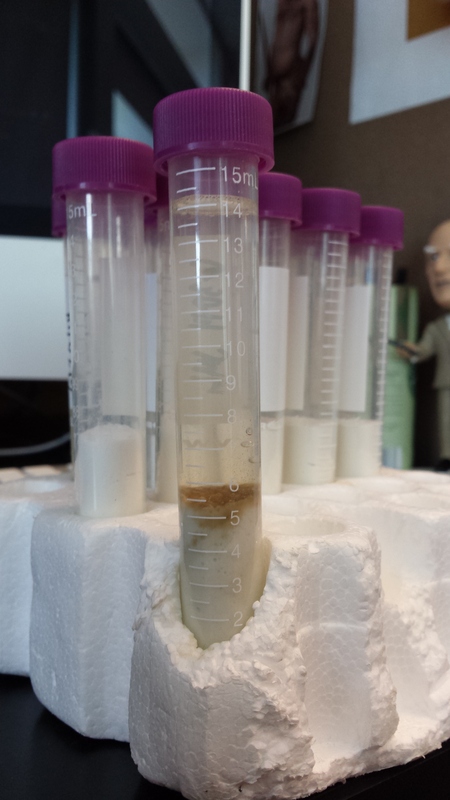 Unfortunately, our tiny microcentrifuge tubes haven’t changed much in the past two weeks. Definitive layers are less visible in our large containers (perhaps due to their non-cylindrical shape? 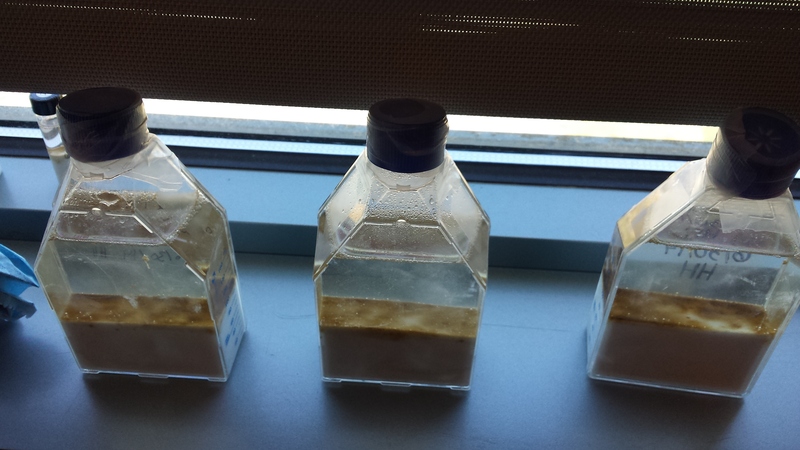 ), but there is significant visible growth compared to the containers at 1.5 weeks. Additionally, upon closer inspection both red and green splotches can be found in the container. 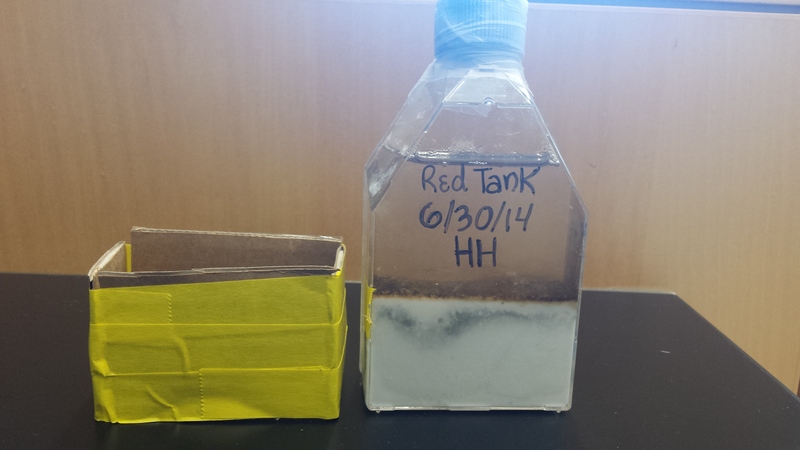 At first glance, the container that we covered to simulate soil conditions looks similar to the uncovered columns. 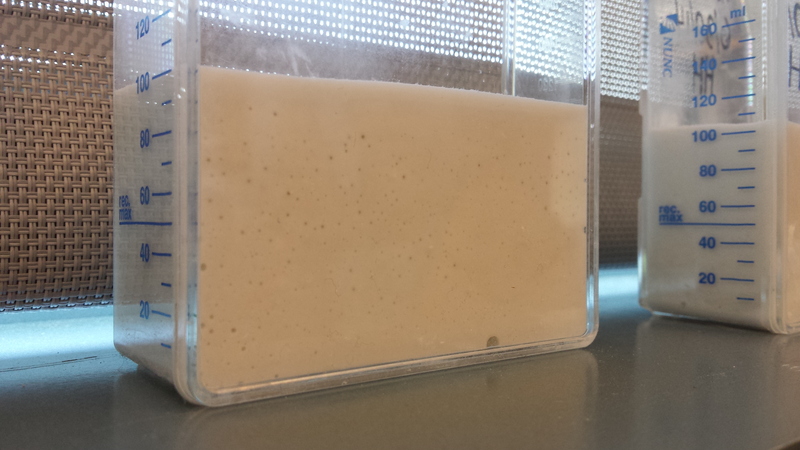 However, there is a small white strip at the top of sediment that we don’t see in the uncovered columns. 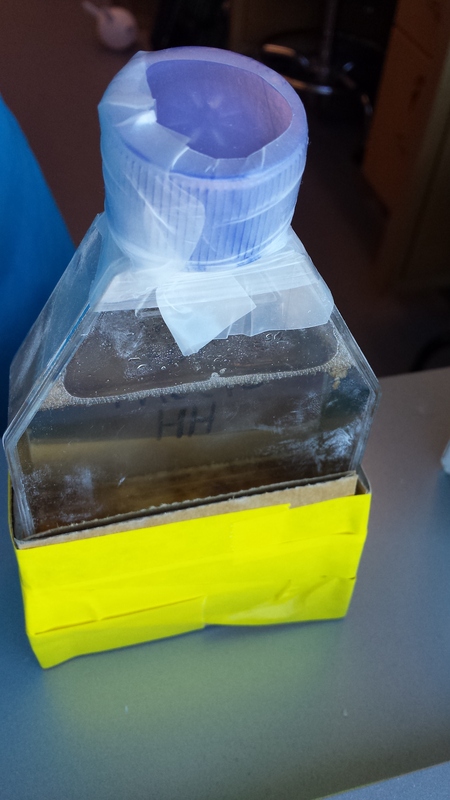 There also appears to be a biofilm growing along the sides of the container. 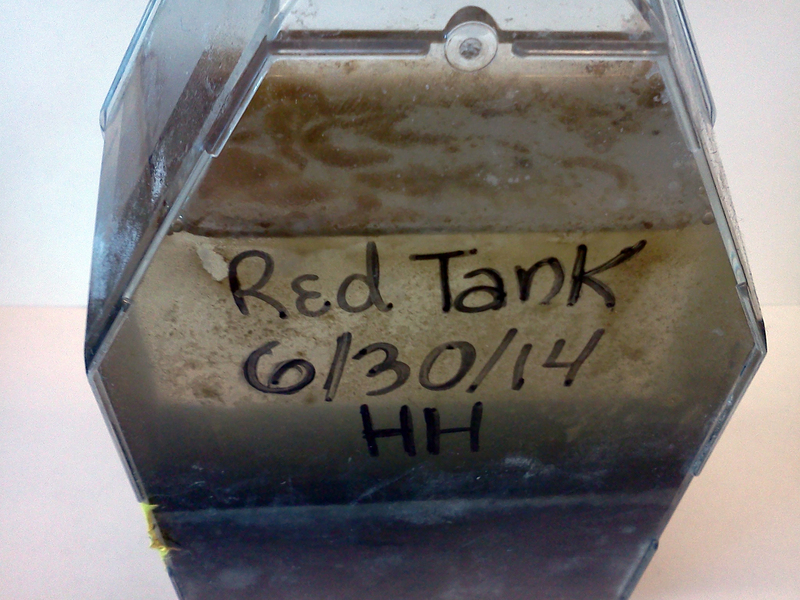 As well as the beginning of a layer floating on the top of the seawater in the container. We decided to keep one vial where Ammonium Acetate was added and one vial where Potassium Nitrate was added in complete darkness. 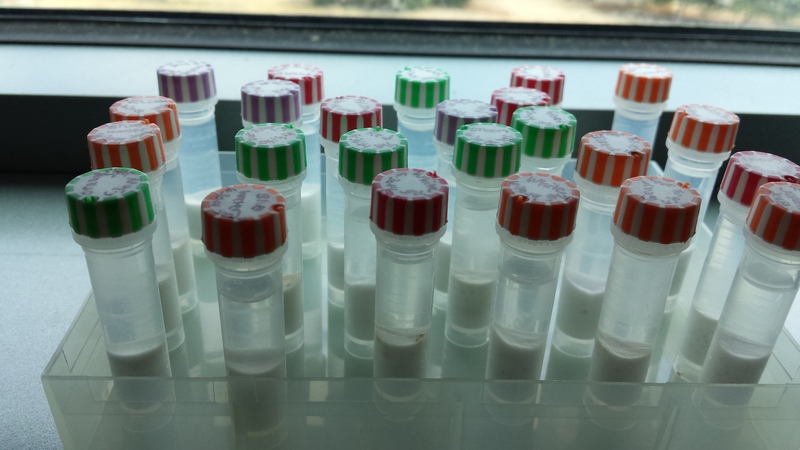 Notice the difference in the amount of bubbles between the vials under different light and chemical conditions. 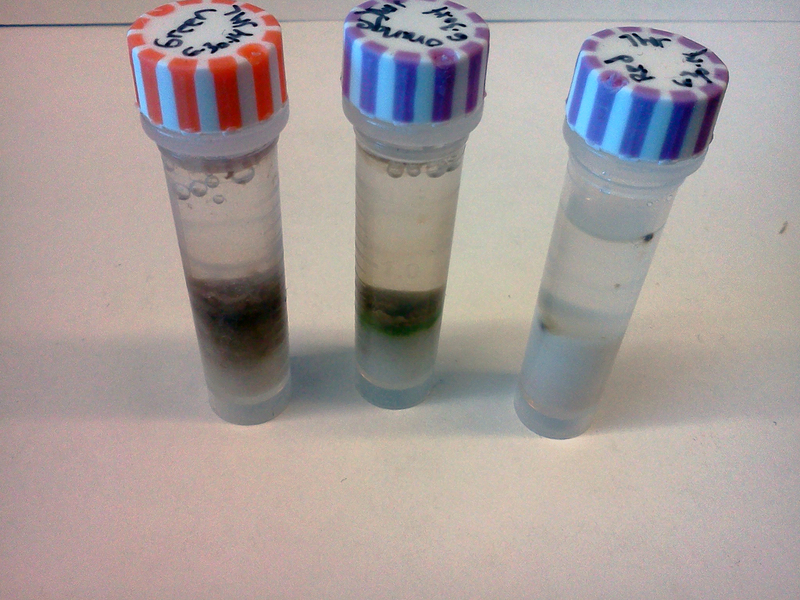 All three of these vials have seawater from the same location. Often when microbiologists begin to explore an unknown (or relatively unknown) environment, they begin by using classical microbiological techniques to try to characterize the communities of microbes living in that environment. 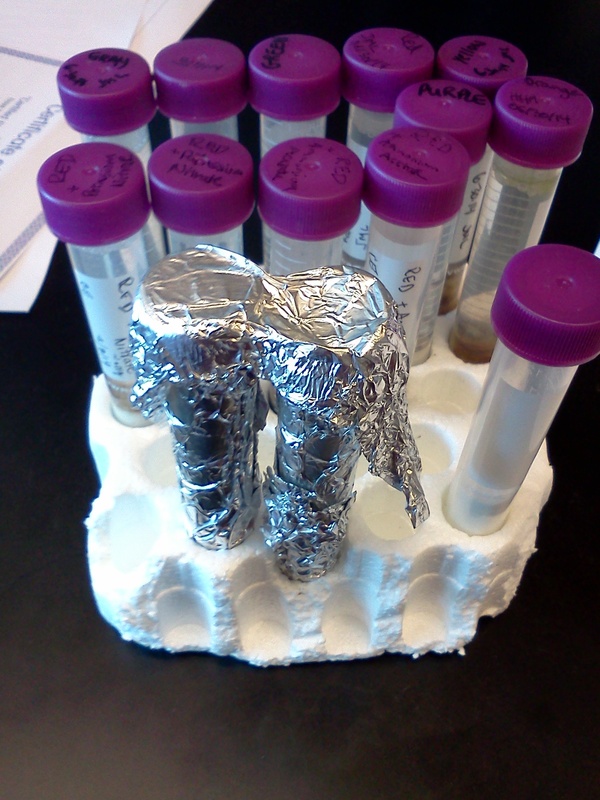 These classical techniques are often referred to as “culture-based” because they are oriented towards the goal of trying to grow (or culture) microbes in the lab. 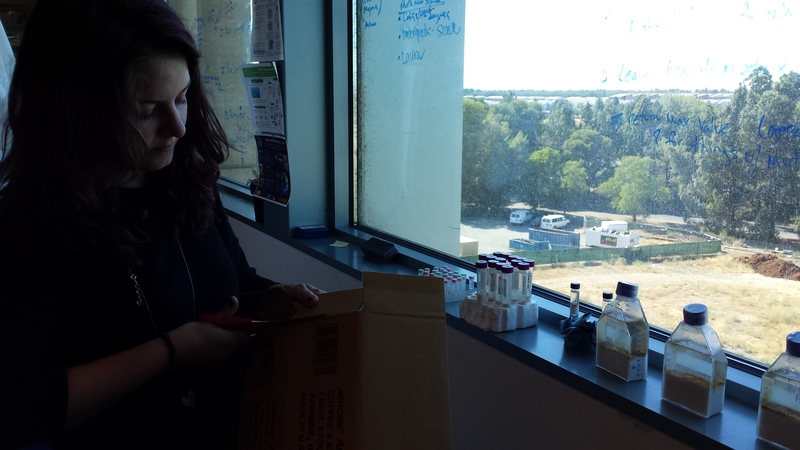 Although culture-based techniques can be limiting (it’s nearly impossible to culture every single organism in any given environment), they are very useful for laying the foundation for the non-culture-based techniques the Seagrass Microbiome project will be using. 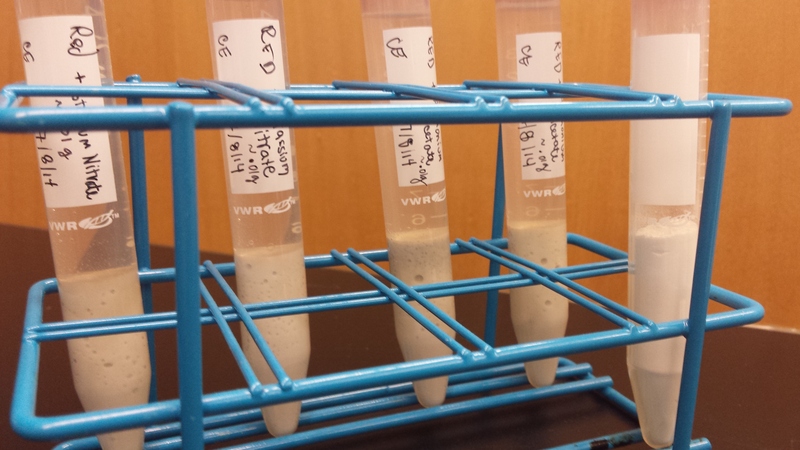 As a result, we in the Eisen lab have been playing around with some classical microbiology techniques alongside our non-culture-based explorations. One of the coolest techniques we’re using is Winogradsky columns. 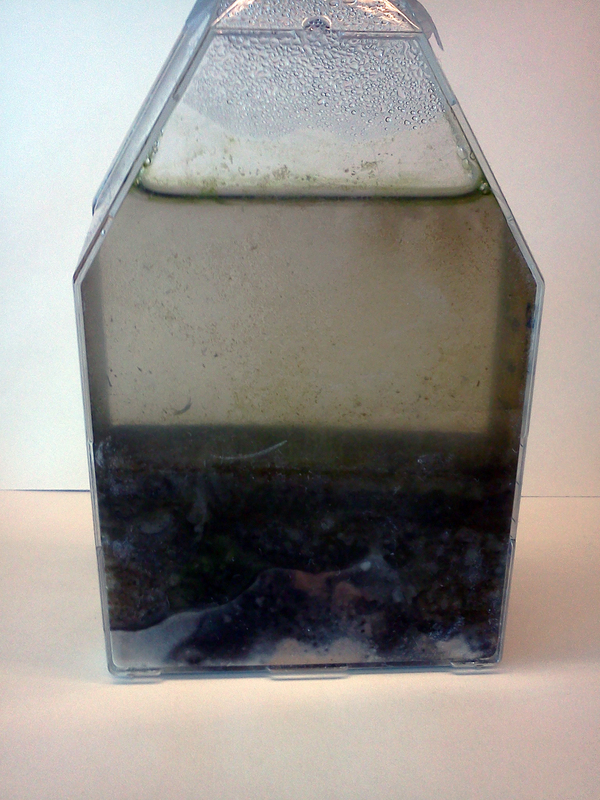 Winogradsky columns are essentially microbial terrariums. The basic recipe is as follows: take a clean tube, add a few essential chemicals, spike in some wild microbes, close the lid and let natural nutrient cycles take over. 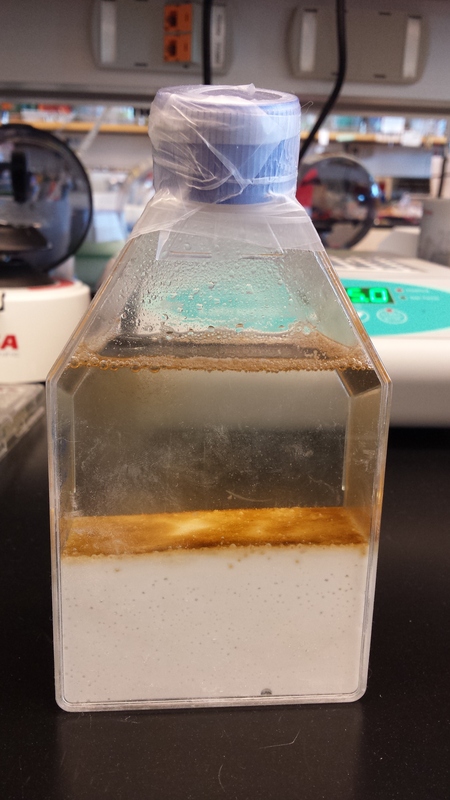 If you’ve done everything right, in a couple of weeks, you should start to see layers of microbes each living in a different mini niche within your mini ecosystem. Two days into the experiment bubbles started to appear. 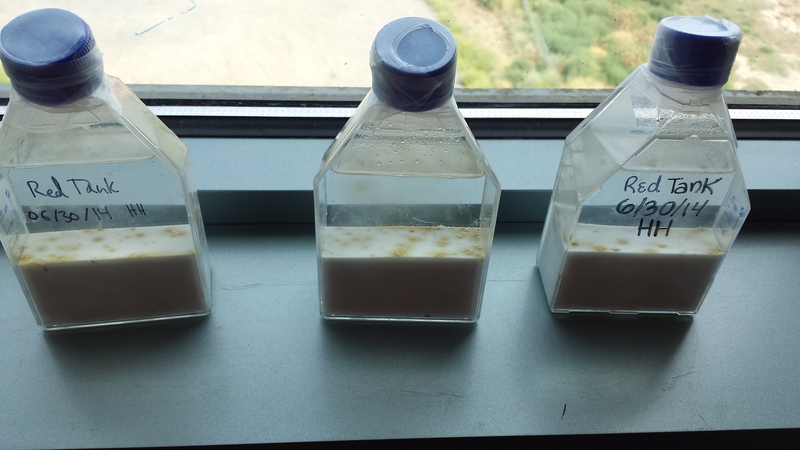 One week into the experiment, brown patches appeared on the surface of the jars. 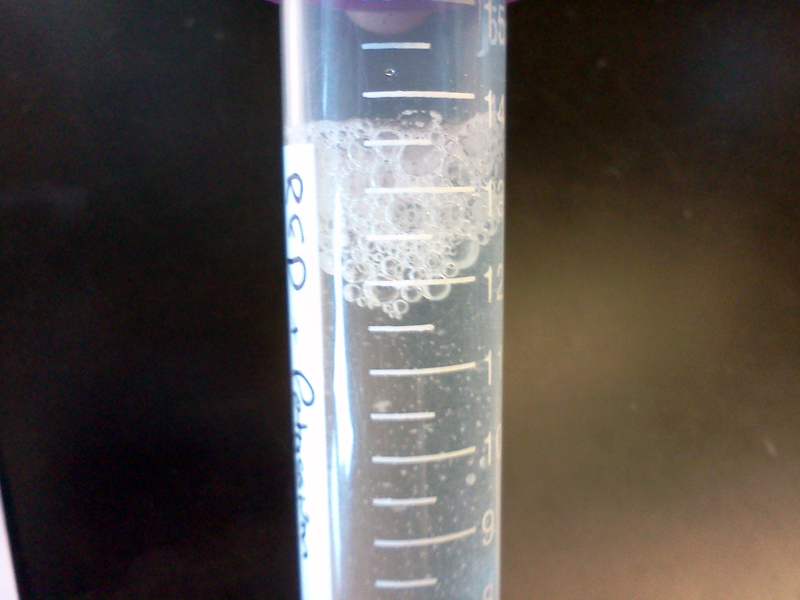 The smaller tubes took longer to show brown spots, at one week all they had was bubbles. At a week and a half the brown mat has spread over the surface of each container. 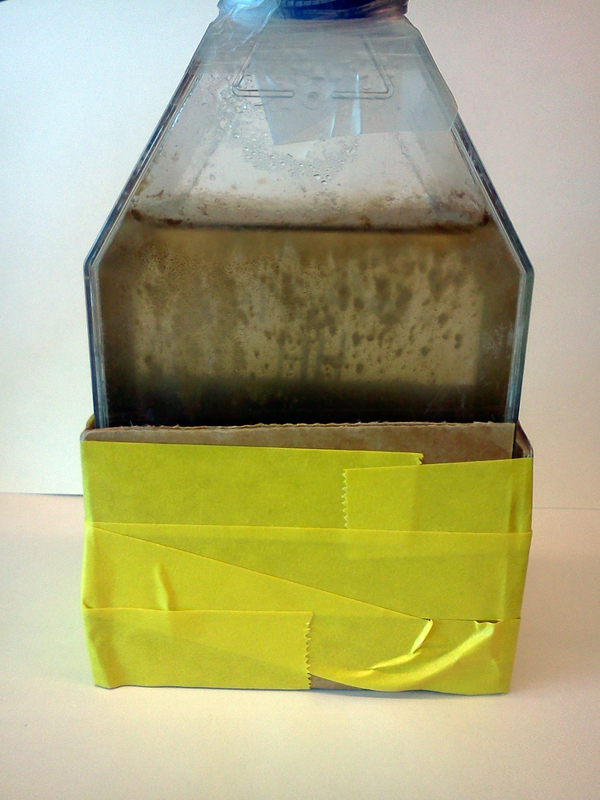 9 days into the experiment, we decided to cover one of the large flasks to simulate soil conditions. 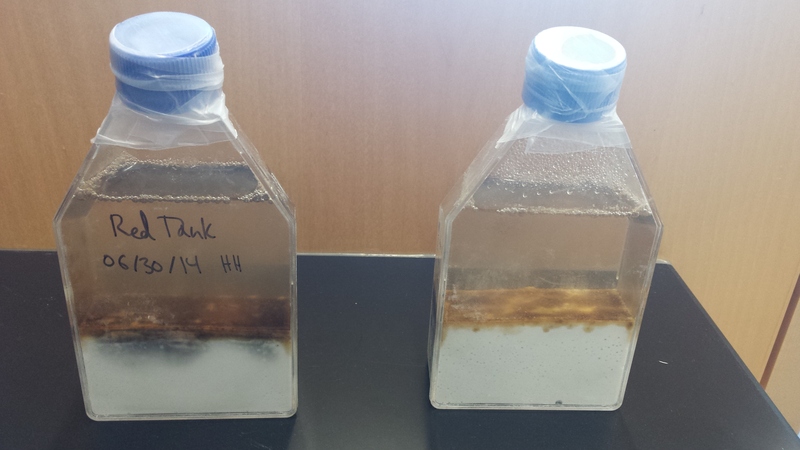 14 days into the experiment dark black splotches appeared under the surface of one of the large flasks. Surprisingly, the covered flask also had the same black splotches developing. Some of the smaller tubes had them as well. 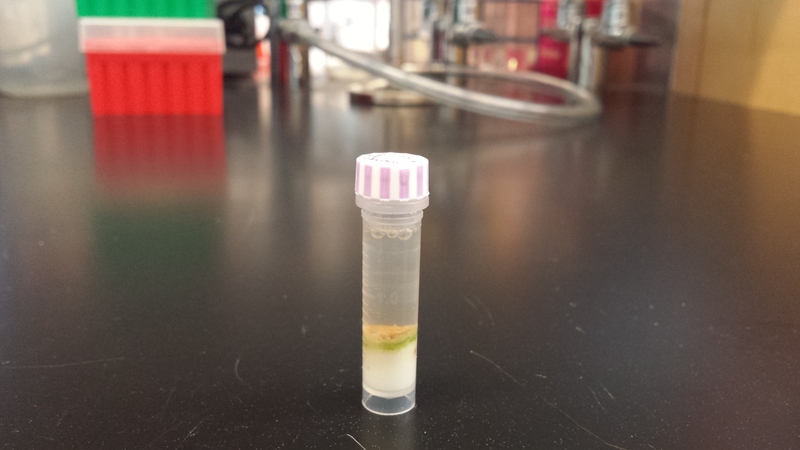 One microcentrifuge tube had a beautiful green layer develop. As a side experiment, we spiked new tubes with potassium nitrate and ammonium acetate to see if the presence of nitrogen changed anything about the development of the flasks. These tubes were created a week behind the others.